But the data is invaluable, so what retail facility managers who support distributed portfolios need is assistance in understanding the vast amounts of data and proactively take action….because within retail – every penny counts. By leveraging the Internet of Things (IoT), retailers now have the opportunity effectively drive waste out of their business and improve efficiencies across their distributed portfolio without compromising the guest experience. Greg will explain how business intelligence providers offer retailers the ability to gain real-time visibility across their distributed facilities and through business analytics can effectively drive consistent and long-term improvements across their portfolio while dramatically reduce energy waste. 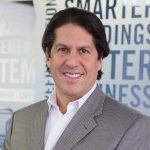 A serial entrepreneur, Greg holds a Bachelor’s degree in electrical engineering from Lehigh University, a master’s degree in electrical engineering from UC Berkeley, and an Executive MBA from Southern Methodist University. Greg has been recognized for his success in building high-performance technology companies. Prior to running EnTouch Greg spent several years at what is today Eltek (formerly known as Valere Power) where he oversaw the production of power systems for wireless and broadband technology. Greg also served as Vice President and General Manager of General Electric’s Lineage Power.